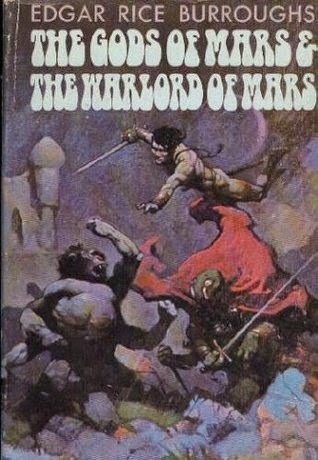 So I just finished reading through "The Gods of Mars & The Warlord of Mars", a single volume containing the second and third of Edgar Rice Burroughs' Barsoom novels. The book is illustrated beautifully by no less than Frank Frazetta himself, though the cover art is a bit faded with age. There are, no doubt, a number of reasons the Barsoom books remind me so much of DnD, but one of them is serialization. 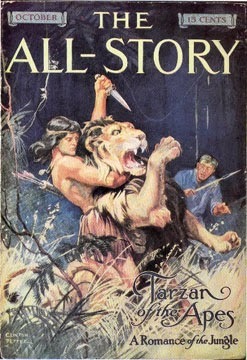 Each of the books was first published in All-Story one chapter at a time. It also seems likely, from reading the books, that they were written in serial. There is little in the way of foreshadowing, and the overarching plot seems haphazard, at best. Rather, each chapter is a romp through action and adventure that picks up where the last one left-off, but ultimately forges it's own path. One gets the impression that Burroughs just sat down to write with minimal preconception about where his pen and his imagination would take him. How similar this seems to how a good DM will pick-up where last session left off, but allow the players and their actions to dictate what happens, rather than some preordained plot. The downside is that many of Burroughs' conceptions come out a bit half-baked. That said, no well-crafted novel can compare to Burroughs' stories when it comes to capturing the spirit of seat-of-the-pants adventure. As a reader, you really never knowing what will happen next. In this sense, Barsoom feels less like literature and more like real life. In life, there is no preplanned plot, no foreshadowing, no systematic wrapping-up of threads. Stories are what we tell ourselves after the fact to make sense of it all, to give a form to the chaos, but they don't capture the tension, the doubt, the exhilaration of forging ones own path through the wilderlands of existence. Ultimately, Roleplaying should be like life, not like reading a book--an all engaging experience of living in another world, not just going through the motions of a made-for-TV narrative. Let us tell our stories afterwards, to to the eager children in front of the roaring fire, or over a hot mug of mulled wine to our fellows, but for now, let us LIVE! I could really go for a hot mug of mulled wine right now. A wonderful and thoughtful explanation of why Burroughs is such a giant in science fantasy literature. Of course he started out amongst greats, writing for magazines (like Weird Tales) and being paid by word count. This may explain the action-packed style and prose of his works. I agree, it feels like a you're on a real life adventure when reading his stories. Things don't always go to plan. The best thing to do is pick yourself up and keep moving. What is best in life?